As planned, The Project Living Hope National Christian Soccer League has come to the end of its first season. One final championship match will take place in December. We thank God for providing the opportunity and seeing it through to completion. We want to thank also PLH for their belief and trust they have put on me to do the work of God. Sports are an effective way to make disciples who, in turn, make disciples for Christ. Sports can be used to transform lives of the athletes; change the mindset of people; help children learn fast; and help people turn their back on alcohol, drugs, smoking, violence, etc. 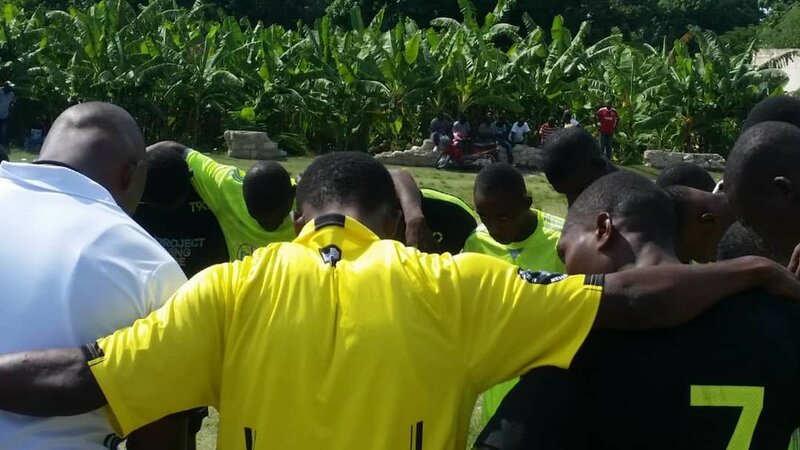 The PLH National Christian Soccer League seeks to draw people to Christ and bring peace to the communities. The league is structured to create opportunities for the athletes and facilitate long-term development in the country. As a leader, I always take note of the fans reaction; players, coaches, and referees actions; and the team organization. What critical and positive things do they do? How are they responding or reacting to each other? And what do I need to change or teach in the future? I see that the winning team is always celebrating, enjoying the game, and happy; but the losing team leaves the field sad, unhappy, and tired, and they complain that referees contribute to their failure. During a loss, the fans sometimes support their teams but sometimes they are mad and ready to fight. That’s the struggle with sports. We can’t have an environment like that! What can be done differently? And how we can use sports not to follow culture but to create our own culture? We need passion for community development. We need to be courageous leaders who step up. We need to see how the community does things and we need listen to them as well. We need to continue to train coaches and referees training to be servant leaders. If we make a positive influence on the coaches, the coaches will influence players and the players will soon influence their families and community. The whole community can change step by step. We need a movement where we share one vision and step up to difficulties and bring results. 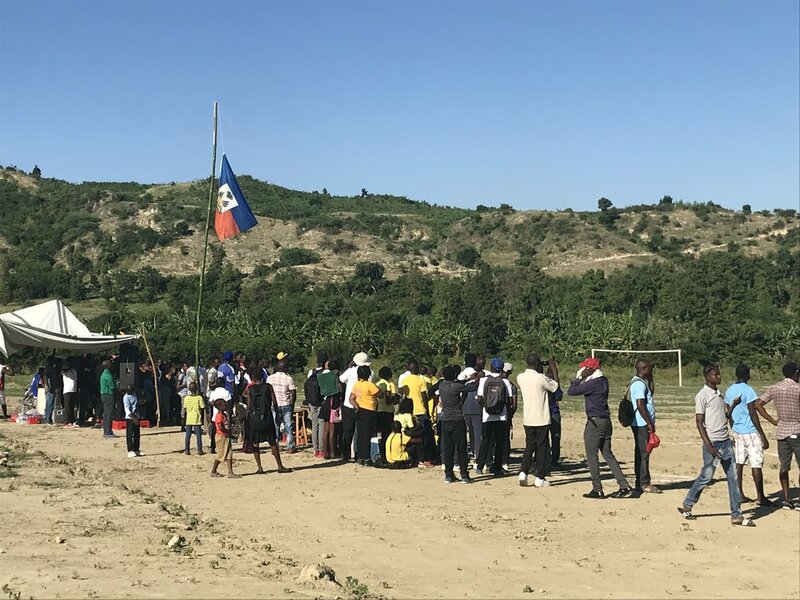 For the first time, we have a national Christian league in Haiti. Players and fans watch the games and hear the gospel. We prohibit use of alcohol at our soccer games. We create opportunity for the players to perform and live strong values, such as: serving one another, working as a team, protecting the environment, and living a life of integrity. We create opportunity for the players and coaches to maximize their talent. We equip leaders to do their work and we engage them into the work of God. 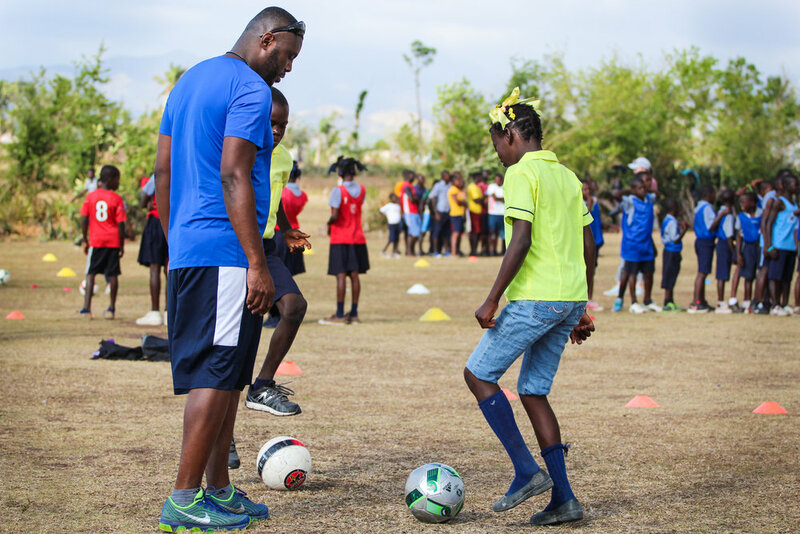 We create opportunity for players to visit other parts of Haiti. We have created a leadership team with servant leadership training and high expectations. We create an opportunity for vendors to come and sell food and drinks at the games. We create a movement of sports where disciples can be made through sports and play. Our goal is to extend the league to every area of Haiti. We want to see the whole country using sports as a tool to transform lives through Christ. We want to see our Christian athletes be a model for their teammates, proclaim the gospel, and make disciples for Christ. 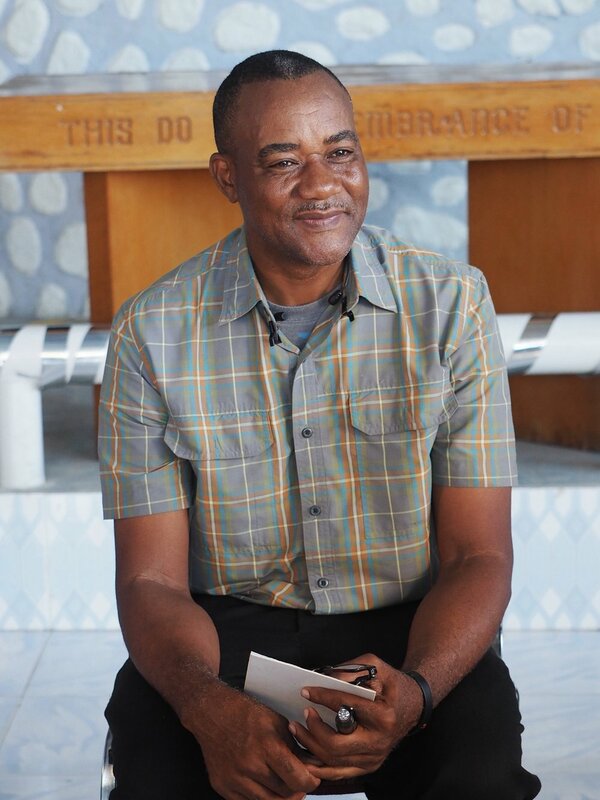 We want to create a movement of Christ-like servant leaders throughout Haiti. 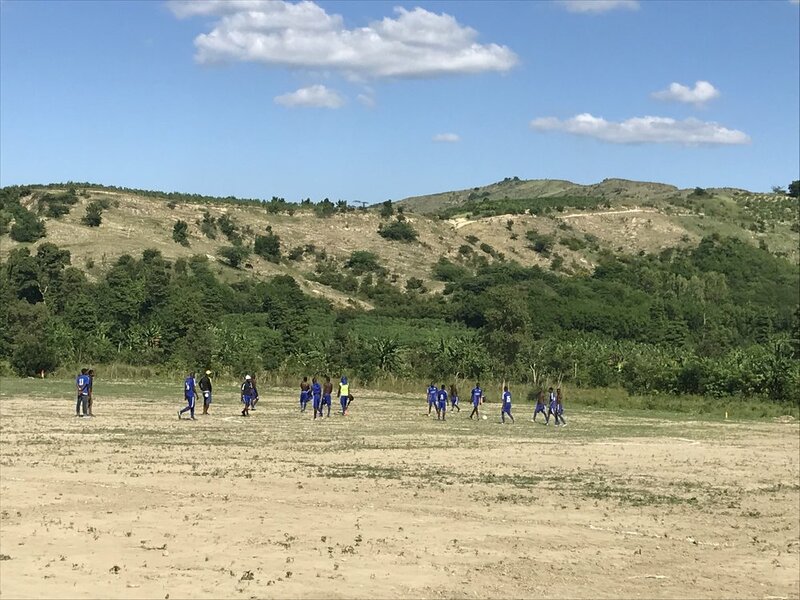 The Camp Marie team has been playing in our Christian men's league since August, but they've had to use the field in the nearby town of Montrouis as their home turf. This past Sunday they got to play their first game on the soccer pitch on the Project Living Hope land right in Camp Marie and the Dessieux family and Laura were there to experience it. Some local boys digging out roots and smoothing out lumps in preparation for the first game. Coaches Benedic and Willio gave the team a pep talk after the final practice. It's a mile-long walk (or ride for the lucky ones) and admission was charged, but oh my goodness, the fans came! It's so hard to capture just how many people were there in pictures, but fun was had by A LOT of people. An estimated 450 tickets were sold. 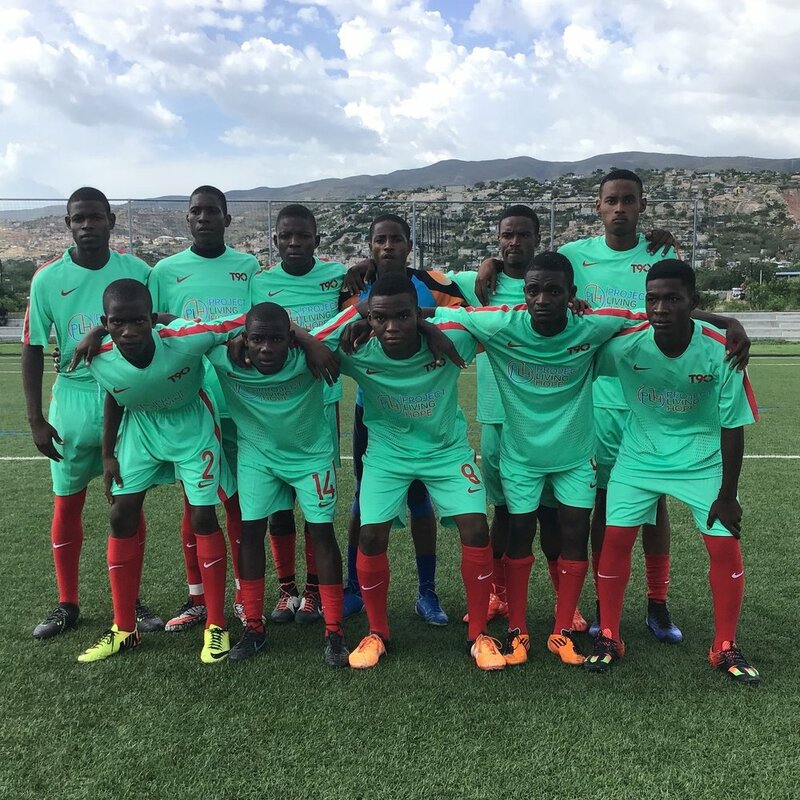 Camp Marie held a 1-0 lead until the last two minutes when the opposing team from Port-au-Prince scored on a penalty kick. Tie game. Oh how I wish you could all see firsthand how gorgeous that piece of Haiti is! This coming Sunday, Camp Marie will host their second game on the new home turf, facing Play It Forward from Fonds-Parisien in the league semi-finals. Haiti has been at the heart of Project Living Hope for over four years, but in the hearts of its individual members for many, many more. Now, Camp Marie, specifically, is in our hearts. Since our land purchase for the King Center in Camp Marie last Fall, we have sought to truly comprehend the heart of the local people and to embrace their community as our own. We have done this by getting out into the town itself and interacting with its people out on the streets, in the farm fields, and along the soccer pitch sidelines. We have had conversations with the mayor, council members, local pastor, community members in a town hall forum, and families in their homes. Unsurprisingly, we find that the people of Camp Marie are not too unlike ourselves! They want not just to survive, but to thrive. They want a better life for their families and their children. They want to build a stronger Haiti - the land of their passion. And they want not just to be in the ranks; they want to be at the helm of all that it takes to achieve their dreams. They do not want a handout; they want a hand up. They know that the road is long and that it involves much: education and training, hard work and personal sacrifice, strong leadership, and a wholehearted trust and reliance on God. In as much as we show a desire to work alongside them towards a mutual goal, they are eager to welcome us into their midst. 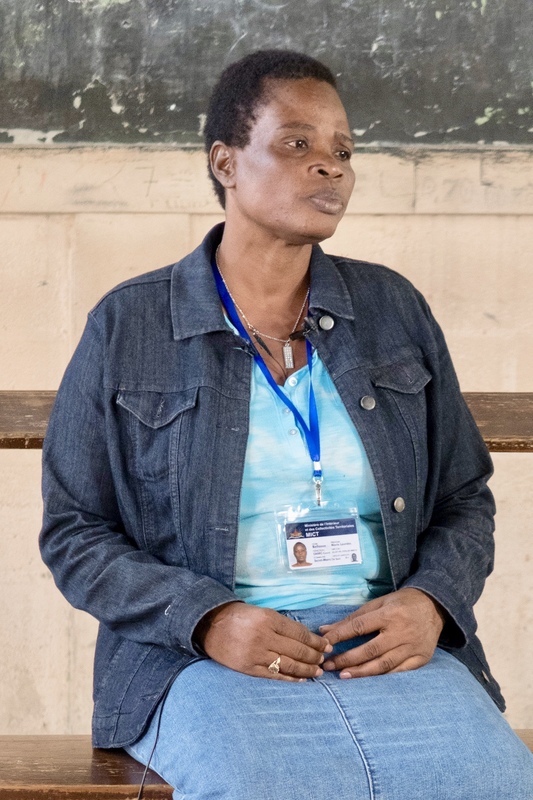 Project Living Hope’s four key areas of job skills training, community development, athletics, and disaster preparedness will directly address the community's self-assessed, current needs. Already, we have launched a youth sports program at Camp Marie to tackle the need for teamwork and leadership skills as well as Christlike mentors. We have also begun an English language training program, as English is a valuable skill for securing employment in Haiti. These two programs already have grown widely popular, causing a demand for more coaches, adequate soccer fields, English teachers, and classrooms. Project Living Hope has a vision to begin various vocational training programs in the coming years. There is a clearly defined need in the region for skills in culinary, masonry, welding, carpentry, electrical, plumbing, and agriculture. Successful training in these skills will require both classrooms for the academic portion and also a kitchen and shop for hands-on practical application. Project Living Hope focuses not just on the individual’s success, but ultimately on the success of the community as a whole. We dream of a place where people can come together and share ideas and common experiences. This can happen along a soccer field, cheering on kids and neighbors; and under a roof, where seniors can visit and play cards, friends and families can gather for celebrations, and all generations can learn and share their knowledge. Finally, in times of disaster, what better place to seek refuge than a structure specifically designed to serve the community? After spending much time getting to know the community of Camp Marie and listening to their ideas and sharing our own, we are confident in the direction that God is leading us. Having identified the existing needs, we have conceptualized and in some cases launched programs that we can develop to satisfy these. Now, we have drafted a building complex specifically designed to facilitate these programs and serve the community of Camp Marie. A COMMUNITY HALL to host meetings/events and bring people together. An EDUCATIONAL CENTER full of classrooms and including a large kitchen for culinary training. A SHOP for hands-on vocational trade skills training. A GUEST HOUSE to house mission teams, coaches, educators, trainers from outside the area, and our champions. An outdoor SOCCER FIELD and BASKETBALL COURT, where teamwork building can occur. Surrounding LAND, where agricultural skills can be honed. Such a campus will permit our vision to materialize quickly as we gain momentum towards ultimately building The King Center Phase Two: a sports complex that will house so much more than sports. We are excited to have the participation of the local Haitian community. Already, they are partnering in the excavating of an access road to our property. Our desire is to keep the Haitians involved throughout the process by providing employment and training while our buildings take shape. At the same time, we strive to construct top-quality buildings that will withstand all the forces of nature. In order to achieve these two goals, we are partnering with MSAADA Architects and other local organizations that share our vision of empowering Haitians and can partner with us in the training and planning processes. We believe God has a heart for the people of Haiti and a plan to give them a hope and a future. We at Project Living Hope share His passion and want simply to be used by Him. We are humbled that He would elect to use us and permit us to grow in relationship with the people of Camp Marie as we work to empower Haitians to build a stronger Haiti. By His Spirit, Haiti can once again be transformed back into “La Perle des Antilles”, The Pearl of the Antilles. My name is Pierre Descieux and I am one of the board members for Project Living Hope. I was raised in Haiti but moved to the U.S in my early teens. I remember playing football (soccer) in the middle of the street where I grew up. The street would be closed to traffic and all our neighbors, family and passersby would gather to watch. Everyone would cheer for us kids for putting on a show. We didn’t have a coach showing us the game, we didn’t have a referee, and our soccer ball was made from a balloon surrounded with rags and plastic. We usually kept the real soccer ball for playing in the grass and dirt a few streets away. Although my grandmother was not a football fan, she was always seated on the side of the street to watch the games. Haitians are very passionate about the game of soccer. Last January, I was able to participate in the weeklong soccer camp in Fonds Parisien with Guesly and the team from Oregon. I was overwhelmed with personal feelings because it brought back so many memories. Our team had lots of soccer balls, jerseys, shoes, and other equipment. to distribute The children and coaches were so happy that even the quiet ones couldn’t contain themselves. From that day on I fully understand the impact PLH’s vision could bring to the children of Haiti. During that week of camp, Guesly and I began making plans for our next camps in Fonds Parisien. We wanted to come back as soon as possible because we had seen the importance of teaching the youth organized soccer, an opportunity neither of us had growing up playing in the street. But our plans were crushed midyear even as we were planning for our next trip. Due to an unforeseen situation, we had to make new plans. These two verses came to mind as we were looking and listening for God’s direction in the midst of our planning. In Fonds Parisien, I believe God was teaching us how to best serve a community; he was preparing us for what He had in store for us. As an organization God taught us to rely solely on Him. And God led us to a small community near St. Marc on the western coast. There, in Camp Marie, we have truly seen how our presence will make the greatest impact. We’ve also seen God’s hope in the eyes of the people in the community. In a few weeks, PLH will have our first soccer camp in two different communities in our new location. The excitement is very high among kids and adults in the communities. Just walking around the community, strangers were shaking our hands thanking us for thinking of them. 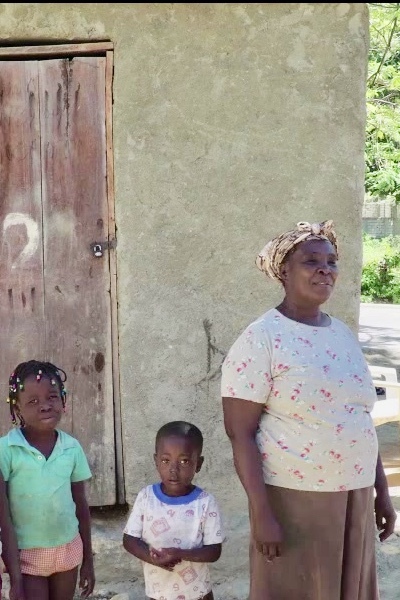 In their eyes, they see us as Haitians coming to give back to their forgotten community. The youths are excited about the camp and were eager to show us their skills as we passed by. We are looking forward to working in our new location and we are eager to share with you all how God is using all of us to further his kingdom.